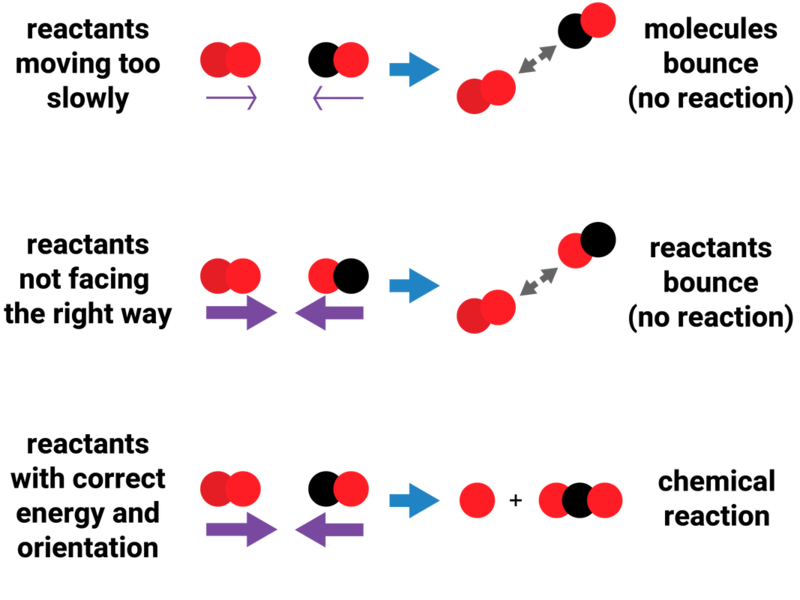 Collision theory explains how various factors affect rates of reactions. According to this theory, chemical reactions can occur only when reacting particles collide with each other and with sufficient energy. 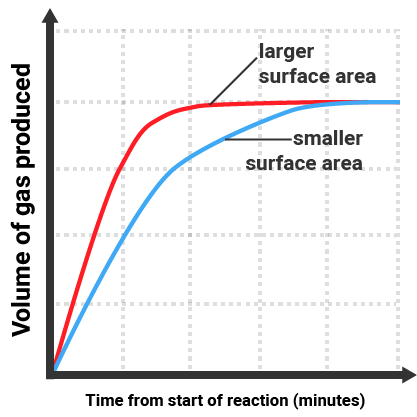 Increasing the concentration of reactants in solution, the pressure of reacting gases, and the surface area of solid reactants increases the frequency of collisions and so increases the rate of reaction. Increasing the temperature increases the frequency of collisions and makes the collisions more energetic, and so increases the rate of reaction. 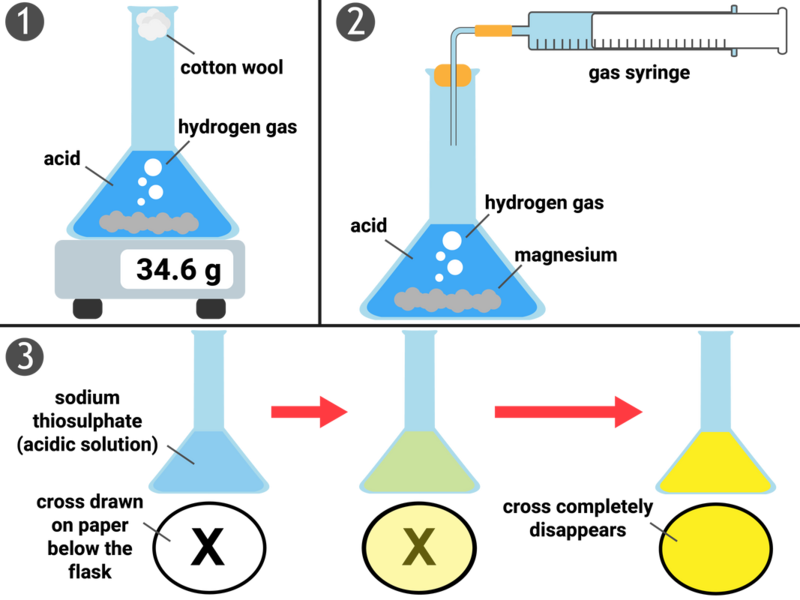 The quantity of reactant or product can be measured by the mass in grams or by a volume in cm3. The units of rate of reaction may be given as g/s or cm3/s. For the Higher Tier, students are also required to use quantity of reactants in terms of moles and units for rate of reaction in mol/s. This method works by measuring the amount of mass change during set time intervals, and then the data can be plotted on a graph. Often easier than measuring small changes in mass. This method works by measuring the amount of gas collected during set time intervals, and then the data can be plotted on a graph. This can either be done to measure the change in colour, or to measure change in opaqueness (disappearing cross - as the cross slowly 'disappears' due to precipitate forming). The end point is quite inaccurate when using the human eye, so to increase accuracy we can use digital data loggers instead. 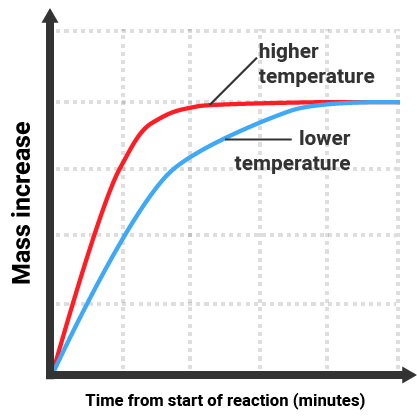 Increasing the temperature of a reaction gives the particles more energy to collide. This leads to more frequent, successful collisions and so the rate of reaction increases. 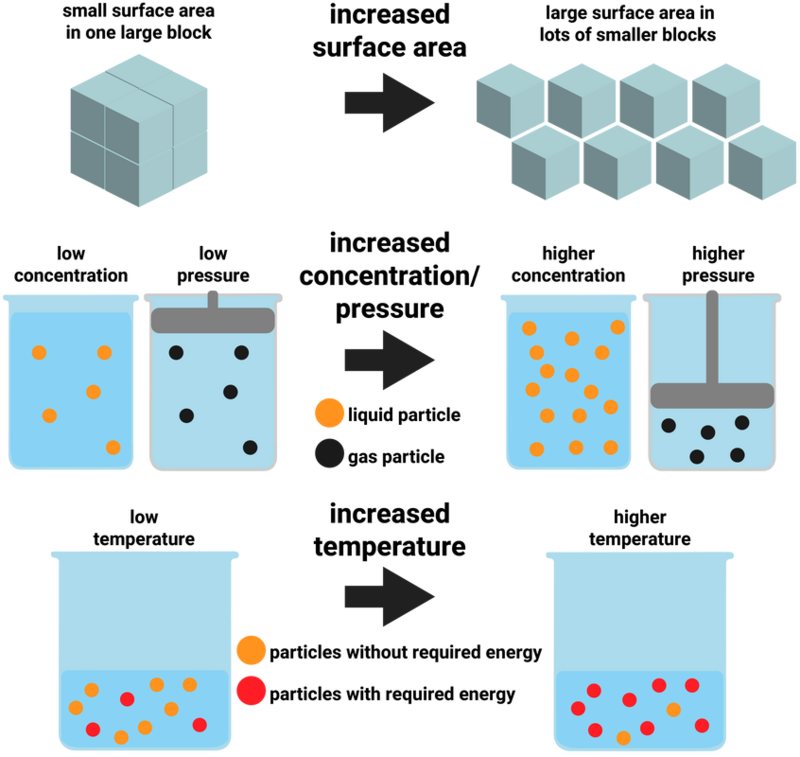 Increasing the concentration (for liquids)/pressure (for gases) of reactants, increases the amount of particles in a given volume. This leads to more frequent, successful collisions and so the rate of reaction increases. Increasing the surface area of reactants frees up more particles that are available to collide right away. This doesn't add more particles in to the reaction, it only allows particles that would have once had to wait for other particles to react first to be available. This leads to more frequent, successful collisions and so the rate of reaction increases. 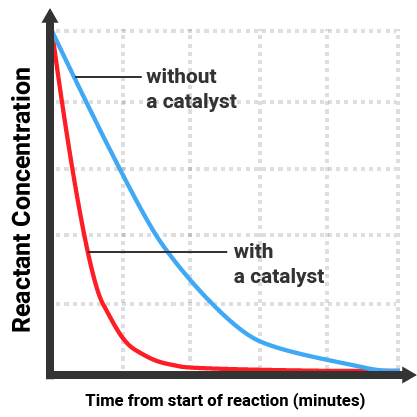 Catalysts change the rate of chemical reactions but are not used up during the reaction. Different reactions need different catalysts. Enzymes act as catalysts in biological systems.